I am quite the novice when it comes to fountain pens, but like many virgins, now that I have discovered the vice, I am entering into it with gay abandon and a burning desire to Own All The Pens. I have previous form when it comes to collecting. I have a collection of tarot decks that just sort of appeared out of nowhere and that I am too afraid to tot up my expenditure on. I not only have one copy of things that I love but sometimes THREE copies of things that I love. And this is how they are currently stored. A cardboard box that is so battered not even our house mice want to live in it. 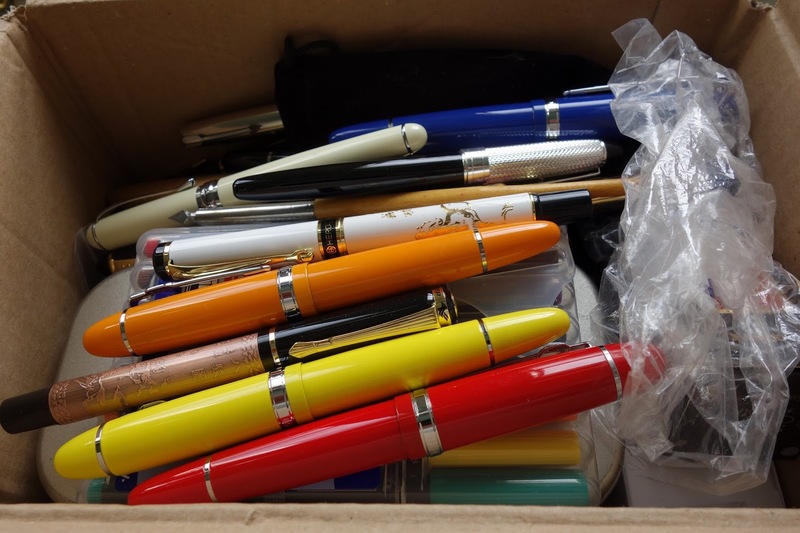 If you are just starting out, the fantastically supportive group of like-minded souls of Facebook's Fountain Pens UK will not only hold your hand through any tentative purchases you might make. but evilly enable your buying habit to credit-card melting levels. They're super-generous with their knowledge and their ink samples, so get yourself along there! Got any attractive storage solutions you can share? I look forward to reading more entries, is it possible to subscribe by email? Test tube holders for easy access. That's a great idea for the ones that you are using on a regular basis - I like it! I'll check those cases out - what a brilliant excuse for getting my collection up to 48 lol! A rookie's guide to all things inky and papery. Warning: may contain gratuitous swearing, references to Tom Hiddleston and Tom Hardy. Also, greyhounds. content © Her Nibs. Picture Window theme. Theme images by jusant. Powered by Blogger.